Last night, I went to a party. Each year around this time, Lee Dale and Jay Goldman organize a get-together just before South by Southwest, ostensibly for Torontonians heading down. Cheekily-titled Canadian Livers in Training (CanLIT), it’s a boozy, loud, and utterly wonderful time. And that’s coming from someone who’s a bit of a party wallflower. I didn’t have any deep conversations last night. I might have spoken to ten people in a room of about 150. But what it reinforced for me is that life is about connection with other people. I would argue that work should be, too. This might sound strange coming from someone who has worked and lived online for the past decade or longer, but I think that as wonderful as computers and mobile devices and the web can be, they have contributed to much more isolation in the workplace. I’ve spent the past few years miserable in high-paying and some might consider cushy jobs writing and building “communities” on the web. Miserable because in the workplace, my day and the days of everyone I worked with consisted of long stretches alone staring at a screen and not actually talking to each other. This might work for some among us. It’s not surprising that tech jobs are often filled by people with some form of social dysfunction, but I think I’m arguing that our workplaces reinforce and in some cases may even help create that dysfunction. I’ve certainly learned that personally, I need a job where I can spend a significant amount of my day interacting in real space with human beings, preferably smart people. It seems a gross injustice that most of the people who are comfortable around others, those with so-called “people skills” are often channeled into sales and marketing positions, forcing them to use their gifts in the service of selling more crap, while so many other people in the organization look at these folks with a mixture of envy and resentment. I’m not saying that we should spend our work day holding hands and singing folk songs. Nor am I arguing for more useless meetings. But to me, all of the talk about “corporate culture” is meaningless if we all work alone. Thanks to Flickr user cliff1066™ for making his images available under a Creative Commons license. 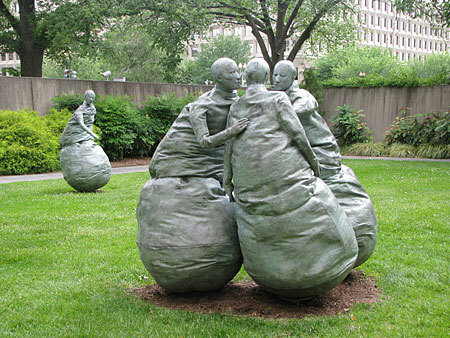 The sculpture is called Last Conversation Piece, and it’s by Spanish sculptor Juan Munoz (1953-2001). 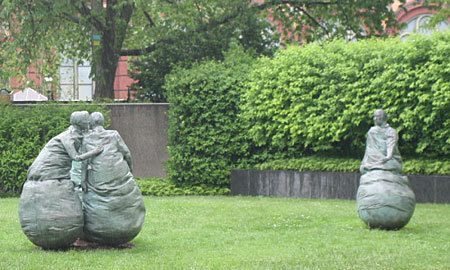 It’s in the Hirshorn Sculpture Garden in Washington, DC. This is precisely what Patio Friday is for. Doesn’t solve your in office dilemma, but it does give the opportunity to connect with #CanLIT type folks without the loud music and without all the booze. Well, it’s a little less boozy. At any rate, good conversations about life and work in a casual setting. Thanks, Lee! I’ll definitely make the effort to get to some Patio Fridays. But these sort of after-work things have gone on for centuries. I’m hoping to change the nature of our workplaces so that all the best ideas aren’t the ones we scatter after a few drinks and then never get the chance to implement. Interesting thoughts – I agree that the work environment often encourages us to hide behind the screen instead of getting out there, especially for those of us with introvert tendencies. Jessa, sorry you won’t be there this year. I’m overdue for a trip to San Francisco so maybe we can catch up next time I’m out your way. I work at a software development company (as you know); I don’t think it gets much more tech-centric than that. We socialize like monkeys. We (“engineers” aka programmers) have work from home two days a week to ensure we get enough work done. Gary and I agree…actual human interaction is important. We should meet up again soon!